Blue - Ramblings of Mad Shutterbug & the Border Collie Bros. This is in the lobby, after the show. Cast of the show line up to meet and greet audience as they leave. 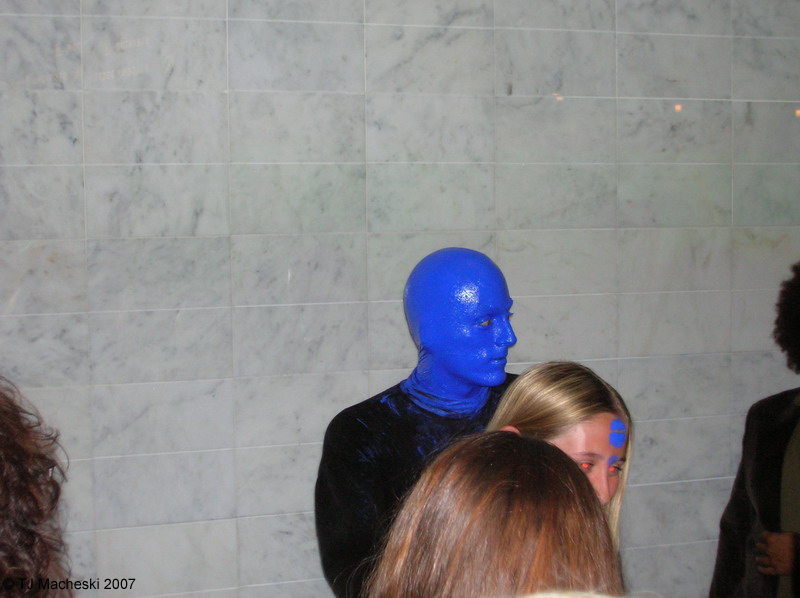 This includes musicians, dancers and such as well as the Blue Men themselves. Thing I liked about it? While the musicians and such did talk with Audience, answering questions and such, the Blue Men stayed in character as mimes. The show itself is spectacular, fun, impressive, Loud, and if one has problems with flickering light may be problematic. In other news, I am tired. Surprised? Nah, neither am I. We are definitely into a Scrub shortage at Hospital, as I've been Scrub Nurse three days out of the four so far. One more to go, anyone want to start a pool on my being Scrub Nurse again? Not sure what the prize will be if you're right.